Unusually for us, we were out on both Friday and Saturday night this weekend which didn’t leave much time for weekend cooking. We had planned on cooking beef brisket today but a surfeit of cheese meant we opted for macaroni cheese instead. I’ve only eaten it once before and was a bit underwhelmed but had high hopes for today’s dish since we had some really good cheese to add to the sauce: Stinking Bishop and Coolea. The sauce was indeed delicious but unfortunately, in my quest for a crunchy topping, I over-cooked the macaroni which meant the pasta was rather dried out. I should have put the whole thing under the grill to brown on top rather than leaving it in the oven. We didn’t follow a recipe for this but cooked the macaroni as per the instructions on the packet and made up a white sauce at the same time. The cheese was stirred through the pasta, along with some oregano and then put into a dish with some more grated Cheddar on top and cooked for far too long. Subscribe to comments with RSS	or TrackBack to 'Macaroni Cheese'. The crispy bits are the best bits! Are prized in our house! .-= gourmet chick´s last blog ..The Lanesborough =-. Oh, I really fancy come macaroni cheese now! With Lundulph not eating cheese, I don’t get to make and eat this dish, but I did try Delia Smith’s one and that was great. She uses Gruyere and Parmesan, but I think any cheeses you like will do. .-= Caramella Mou´s last blog ..Omelet and Bread Proficiency =-. I never realised there was such a big thing about mac n cheese till the mac n cheese challenge in January. I was thinking a few weeks ago stinking bishop would be great in it. Tastes even better when you make your own macaroni. Instead of the bechamel I tried making a white wine sauce and adding the cheese to that – lighter and more flavour and the glazed the top with the blow torch – grill would work to though. Mac n cheese lends itself to so much variation. Must try that monchego and sherry version too…..
.-= James´s last blog ..It’s your special event – your menu =-. Ah, this is what I’d always order from room service when I was stuck in ny hotels for work… but I still love it… and I love the crispy topping even if it means some of the pasta get a bit hard! .-= Alex´s last blog ..A Knitted Hat =-. .-= The Curious Cat´s last blog ..Remembering to water the plants… =-. 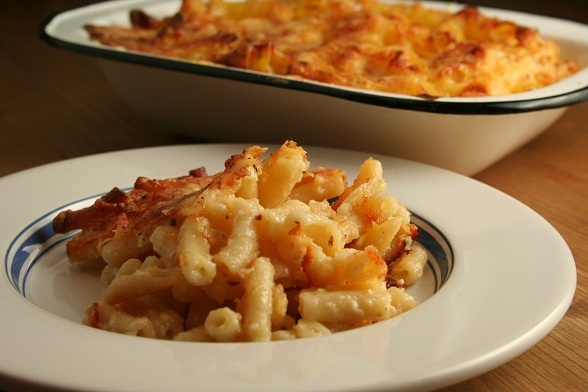 I absolutely love macaroni cheese and love the idea of using such interesting cheeses. I’m afraid I’m rather dull and have always stuck to a traditional Cheddar version. I’ll have to try this next time I have some bits of more interesting cheeses that need using up. I made a macaroni cheese with smoked haddock in it last week which sounds odd, but was really good.